The Shean Strings Competition will take place May 18-20, 2017 at Muttart Hall, Alberta College Campus, Grant MacEwan University in Edmonton, Alberta. The 2019 Shean Strings Competition Programme (English et Français) is available for download here. Application brochures (English et Français) for the 2020 Strings Competition can be found on the string downloads page. Brochures for the 2020 Strings Competition are available on the download page. 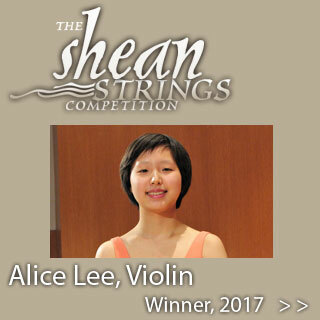 Winner of 2013 Shean Strings Competition: Luri Lee! Winner of 2011 Shean Strings Competition: Eleanor Kendra James!